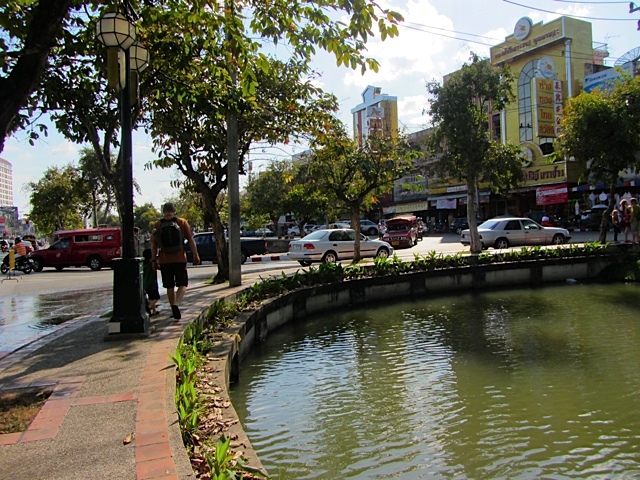 Despite having a rough start in Thailand, we spent 2 weeks in center of Chiang Mai. Most of that time was spent with our friends, which made our time really enjoyable. It’s a busy town that is a favorite of expats and we can see why. The food is wonderful, plentiful and super cheap ($2-3/plate at a restaurant and $1/plate at the street stalls). There is delicious fresh produce available at every market. The fruit is exceptionally good and the coconuts are the best I’ve had ever. Best street food. My kids ate them by the kilo. 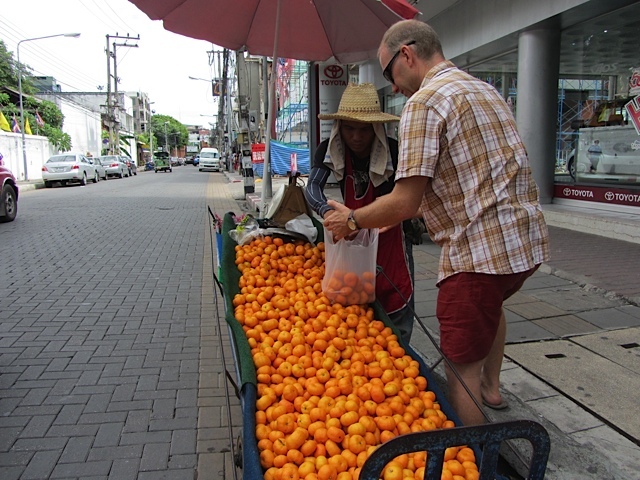 Many digital nomads make Chiang Mai their home. I wanted to know why to see if it would be a place I would consider living in for part of the year. 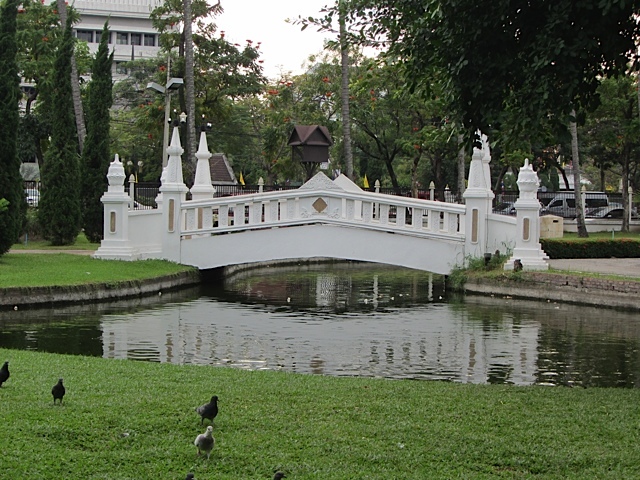 Chiang Mai is the largest and most culturally significant city in Northern Thailand. 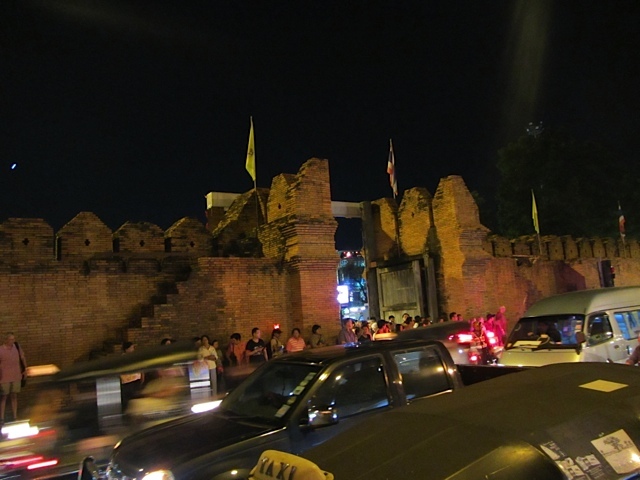 Chiang Mai “New City” became the northern capital of the Lanna Kingdom in 1296. It is situated on the Ping River and the old “original” city is surrounded by a partially kept moat wall. The main area of old town is near the eastern Taepae gate. Taepae Gate – the east side of the old city. Chiang Mai is full of buddhist temples called Wats and you can spend an entire week here just visiting temples if you wish. The temples are beautiful, but one can quickly get “watted out” from viewing the beauty. Eventually, you get to a point where it’s just another temple. At least we do. We’ve had a great time here. Here’s a bit of what we’ve done. 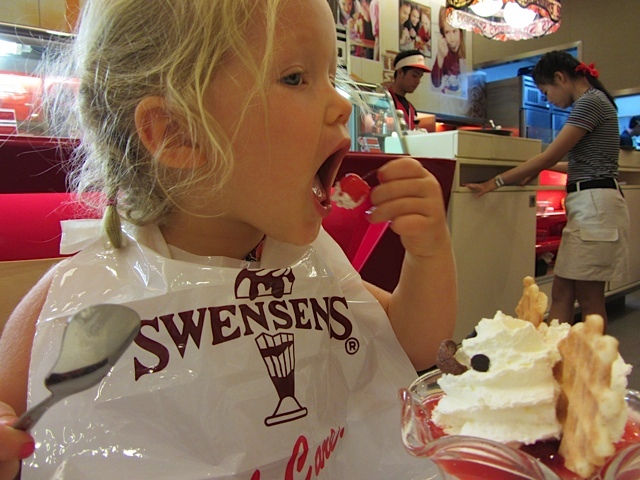 This is the reason we came to Thailand. To experience this once in a lifetime is a blessing. My hope is to come back. 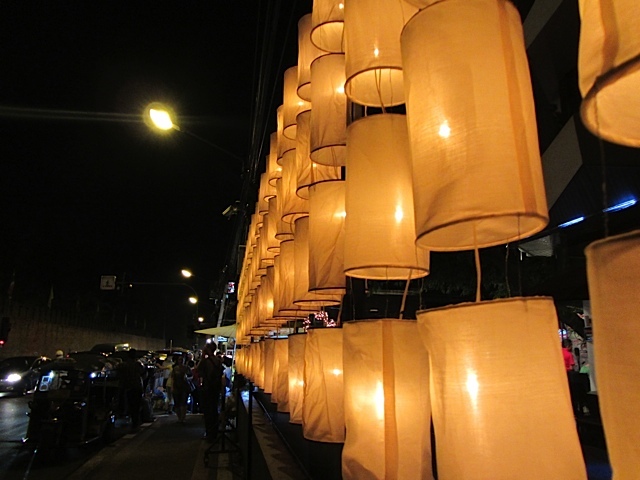 View the beautiful images and video I made at this post: Yi Peng Festival Chiang Mai. This was a splendid site to see. 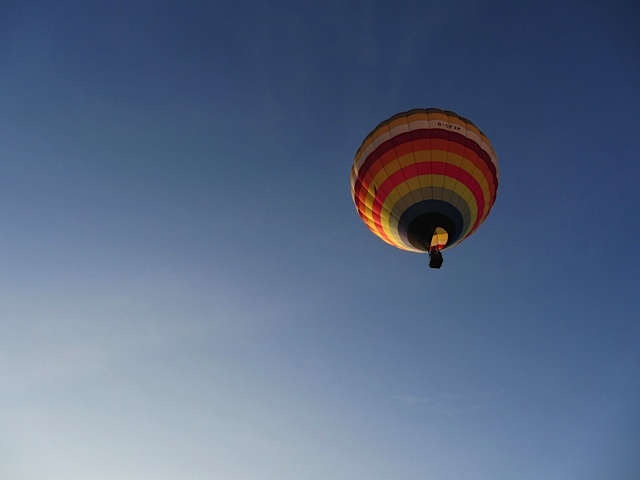 Held at a local golf course, the early morning filling and rising of the hot air balloons was beautiful. Rising of the first balloon at sunrise. There were several international teams (although I’m not sure if this was a competition) and several fun children themed balloons too. 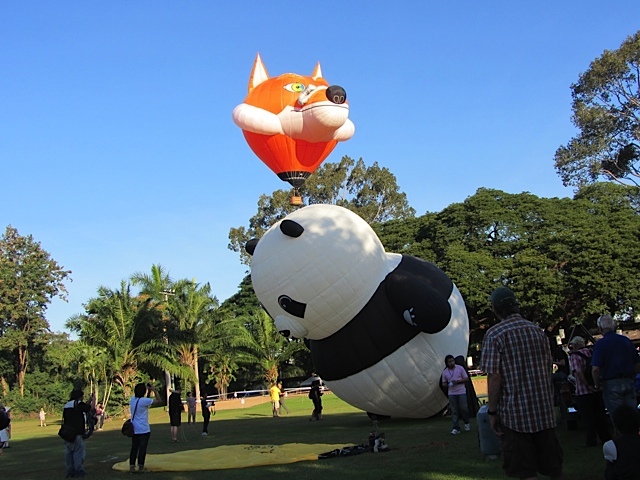 Mr. Fox and Panda rise in the air. The evening though was when the magic of the Balloon Glow happened! Dusk came, the music started pumping and then the hot air balloons strobed their fires in time to the music. I left my camera at home which allowed me to dance the night away with G & I. There were gourmet food booths set up, a raffle in which we won a free high tea for two, and live music. It was an especially welcome since it was the night of G’s head trauma. The city was aglow with floating offerings in the river below and lanterns floating in the evening sky. This festival started as an offering to the river goddess. People make beautiful floating offerings made out of banana stem, leaves, flowers and candles and set them afloat on the Ping River. Then the party begins. In the streets there are performers, food stalls, people randomly lighting off huge fireworks on bridges, sidewalks, etc. Read our experience at Loy Krathong here. 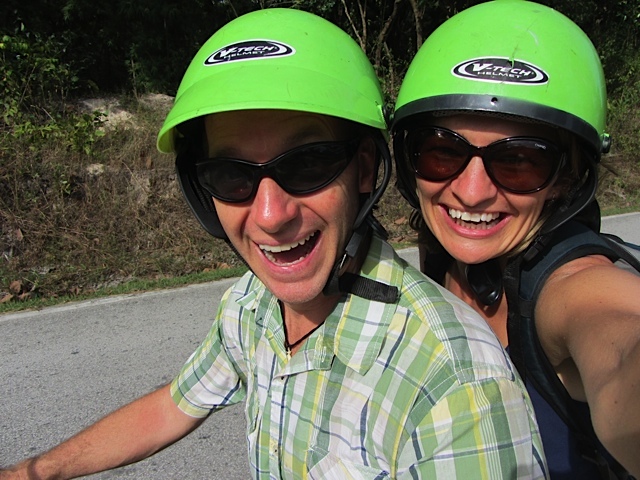 We had to get out of the city for a while, so we rented a motorbike and explored the surrounding green areas. The Lake is a man made reservoir where you can swim, bike, zip line or enjoy a meal in one of the little huts on the water. They serve a famous dish of live shrimp, try it if like things that wriggle and jump on your plate. 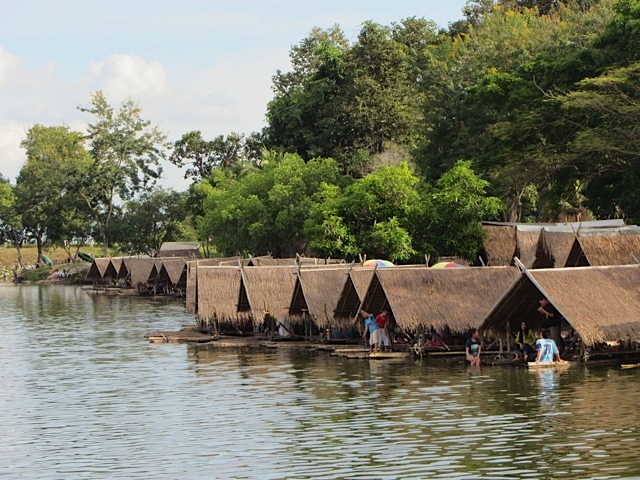 Dining huts on the lake. This was one of the most interactive zoos we’ve ever been to. We were able to feed animals that we normally would never had a chance to do…and up close. We saw giant pandas munching on their bamboo only 15 feet away. We fed giraffes, hippos, elephants and more. 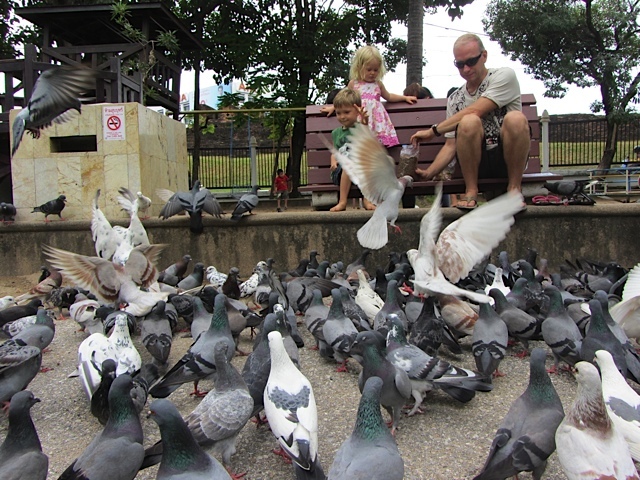 Check out the video and post on the Chiang Mai Zoo Feeding Frenzy. We visited the mall too. It’s filled with great shopping (although I prefer the markets) and tons of restaurants that display their dishes in the window. 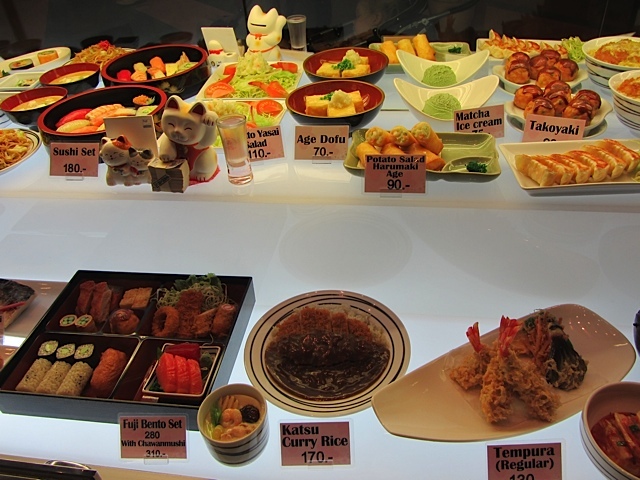 These are models of dishes so you see exactly what you are going to get. No need for a menu..it’s in the window. 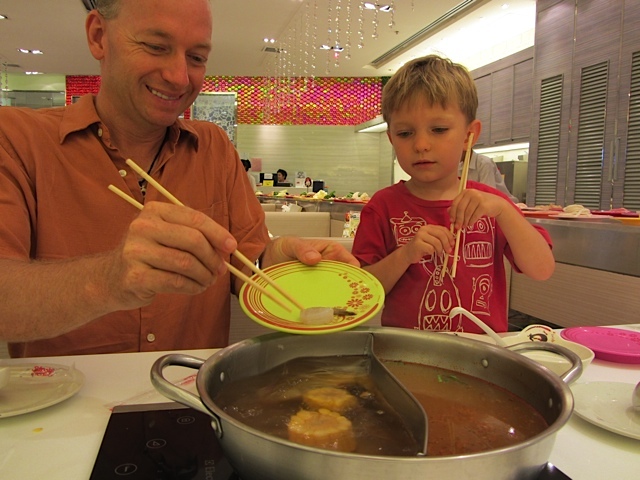 There was an abundance of Japanese hot pot soup restaurants. The table had a induction burner in the middle where a pot of soup was placed, either tom yum soup base or vegetable soup base or both. We opted for the half and half. Adding ingredients to our hot pot. The soup ingredients are on a conveyor belt that goes around the restaurant. Take whatever you want and cook it in the hot pot. There was also a good selection of sushi and a few dessert dishes. We had a great time. Miss I slept through the entire experience, but woke up for this one. Coby McKibbon of Digital Nomad Academy and Thrilling Heroics organized a digital nomad meet up while we were in town. I got to meet several traveling online entrepreneurs and others that worked remotely. Most were much younger than I, mainly men and very few were married. I think I may have been the only one representing traveling family life. I made lots of great connections and hope to see a few of them in my part of Bali soon! I understand why many travelers stay in Chiang Mai, especially with such a great network of people to be inspired from. There is one park in the southwest corner of the old city. The park is place where a bit of greenery and a lot of pigeons call home. 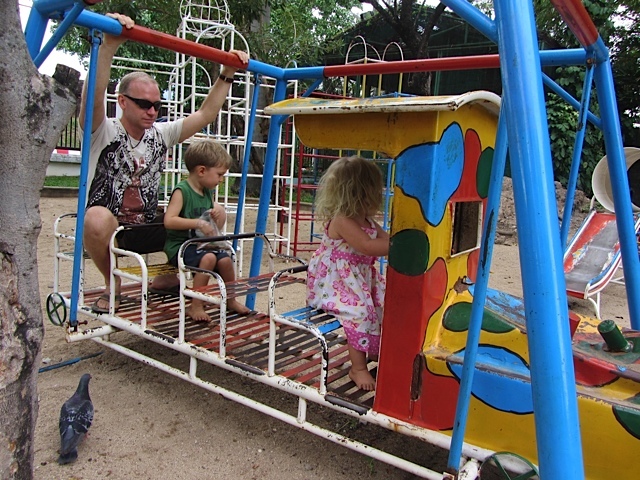 The play land part is of the park is small and rickety, but provided plenty of fun for us. We had the most fun feeding the pigeons. The prettiest piece of the park. By far, the best day we had was at Sammy’s Organic Cooking School. Sammy and his wife run a family friendly Thai Cooking School on the outskirts of Chiang Mai, among the serene rice fields. It was a great break from the city, but more importantly, we all agreed it was the best food in Thailand. Read the full post on Sammy’s Thai Cooking School here…warning though… you will be craving Thai food afterward. 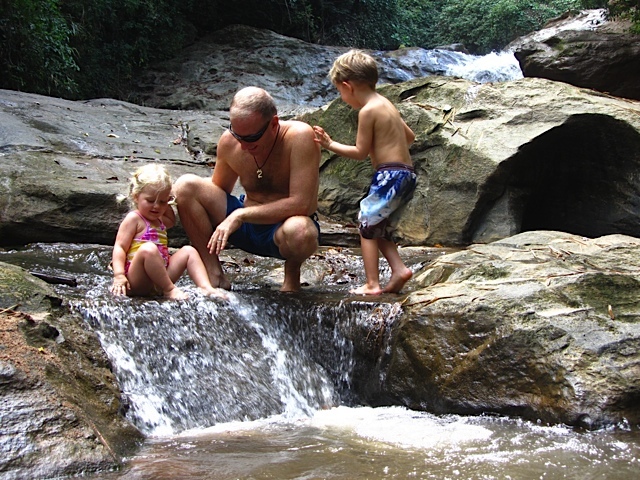 We ventured with 2 other families to the Mae Se waterfall. A waterfall with several different levels to sit, swim and picnic near. Entry to the national park was 100 baht ($3) per adult, free for kids. 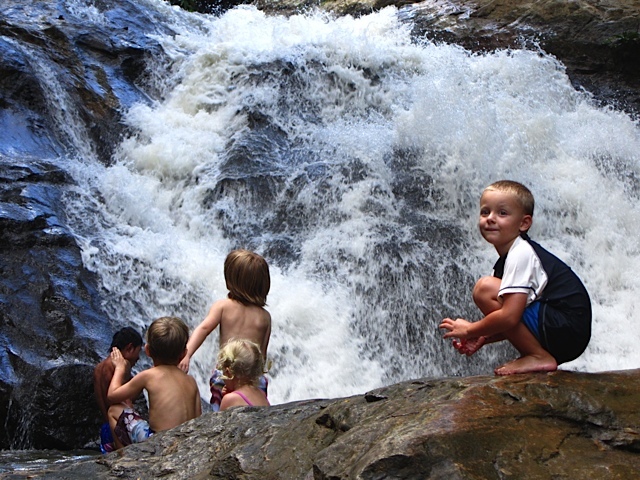 The kids enjoying the energy of the waterfall. There were several vendors at the entryway that will pack food for you in a picnic basket, complete with padded grass cloth to sit on. We played in the water and on the slippery rocks. The only major fall being my own, bumping and bruising every piece of my body that had an edge and bone. 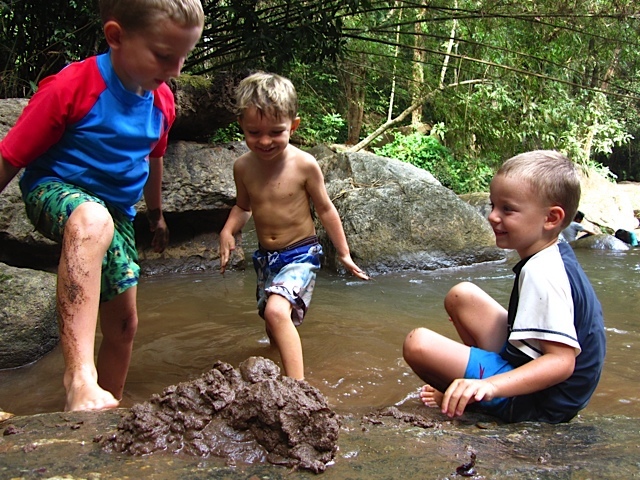 The boys had the best time making a big mud poop volcano. Getting kicked out of our hotel was not a highlight, but was the best thing in the end. I also went to a nice professional hair salon to get a much needed haircut and highlight. I walked out with what looked like nice hair in the darkness, and it wasn’t until the next day that I noticed it was one of the worst highlight jobs ever. At least it didn’t turn purple like when I got it done in Malaysia. (If you missed that update, make sure to like our Facebook page…you’ll get a much more realistic glimpse of life). I’ll be getting my hair redone in Bali…somewhere. Maybe I will just dye it purple. Do I want to live in Chiang Mai? The short answer is no, not really…at least not in the city. The interior of Chiang Mai is a cesspool of exhaust. Song toews, tuk tuks and cars pollute the air so much our throats began to hurt a few days after arriving. We spent many days NOT using any type of transportation because we didn’t want to be on the main roads, where you can see the nasty exhaust being spewed into the air. It cannot be healthy to breathe that air everyday and that is the reason many motorcyclists and drivers use a filter or surgical medical masks over their face while they are driving. Bangkok was cleaner due to most vehicles using the cleaner burning CNG (Compressed Natural Gas) fuel. 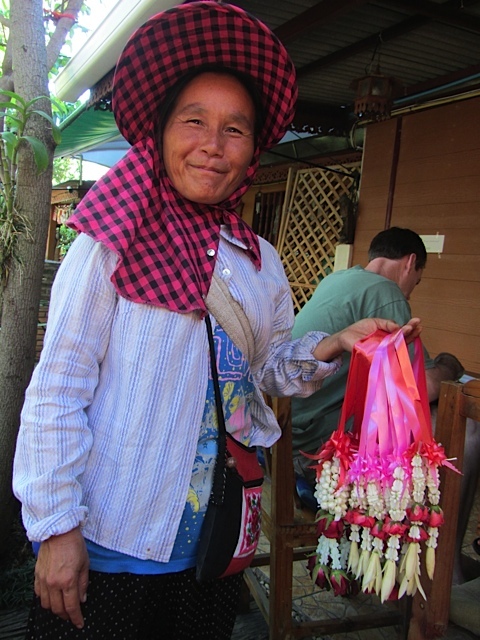 Thai people are quite nice, most of the time. The further you get outside of a big city, the more patient, kind and generally more respectful people are. I think being in the hub of tourist central makes for a few cynical and greedy people, but that’s everywhere. Generally, I liked the quick overview of the Thai culture very much. Super nice, but she wouldn’t give me my change back. The food is excellent, except that it’s not always healthy for you. Mainly rice and noodles, but often it can be cooked with too much oil (and NOT coconut oil) that it takes away from the healthiness of the vegetables in the platter. We had a hard time finding ‘clean’, fresh food. We did, however, indulge in our morning fruit, yogurt and muesli from our favorite market vendor, Tip. That was the healthiest, freshest meal we had. The city does have just about every amenity you could want. The mall itself has a full floor of slimming clinics! Abundant services, great massages, a movie theatre (which is something we don’t have in Ubud), great food…Chiang Mai has got it all at a very manageable size. Public transportation is cheap and awesome. Motorscooters are convenient and cheap to rent too. 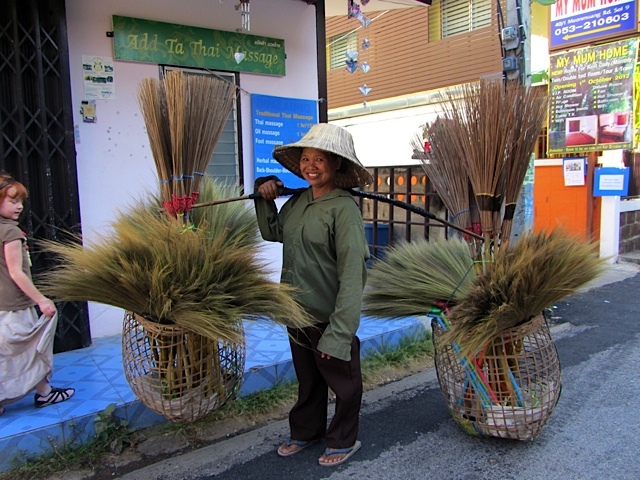 Selling natural brooms on the streets of Chiang Mai. One could really live like a king here for less than $1000/month. I see why so many expats decide that this would be their home. It’s an incredibly social city with a ton of festivals and things to do. Many young digital nomads get caught by Chiang Mai’s trap of having it all (except a beach) for superbly cheap. Some are stuck here because they can’t afford to go elsewhere and others enjoy the quality of life offered for such a reasonable cost. It’s a great place to start an online business and keep your expenses low. Oh, and the internet is FAST! We got 8mb in our guesthouse. You may think that’s slow until you start traveling the world and realize that it is super fast! The nighttime life is beautiful here. There are plenty of bar and restaurants that are stunningly alive with silk and paper lanterns hanging in every color. The city buzzes with people and I love that! What a variety too! Love the lights of Chiang Mai! But I really enjoy the space of land and the vistas of greenery. I love to visit the city, but I need to live a little closer to nature everyday to be happy. My children have more freedom out in open fields and where there is a slower pace of life. I may come back to visit or maybe spend a few months in Chiang Dao or Chiang Pai (which I didn’t get to visit this time around). I also prefer the people of Ubud. The Thai are nice, but, coming from Bali, which is literally the land of smiles, the Thai seem to have a certain ‘edginess’ that I can’t quite put my finger on. Perhaps it was just because they live in the polluted city. A visit to Chiang Mai is worth doing. There is so much to do and we just skimmed the surface. This place could be an interesting spot to spend a few years in. Bottom line? I’ll be staying in Ubud for a while.